PROJECT IS CLOSED DEFINITELY. Leftovers are for sale. 2D drawings to be published soon. For 3D models please contact by E-mail. A typical paramotor is not suitable to be carried by its owner. Usually it's transported by car. And even worse: the dimensions and mass of a typical paramotor prevent us from taking our flying toys in long overseas travels. The paraportator was designed to break these limitations. It's a truly portable paramotor. 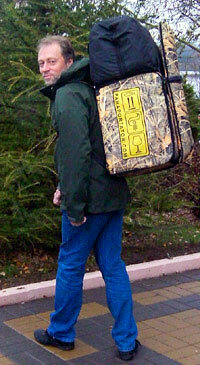 You can carry it yourself, and it's small and lightweight enough to be transported as an airplane registered baggage. Paraportator. Stay mobile. Walk. Hike. Travel and fly your paramotor wherever You want. Open Your frontiers! The unique frame design allows the paramotor to be folded forming a compact and strong container structure. This 45*42*34 cm provides protection to all sensitive parts of the engine that is usually sufficient for common transportation means. When the paramotor frame is folded for transportation the harness is wrapped and zipped around the frame in such a way that all its important elements - straps and buckles get inside the package and well protected. An innovative low hang point attachment system allows to adjust the motor inclination in flight and has lower total weight and better pitch stability than PAP-style straight bars. The original construction of the harness suspension system allows the harness bars to rotate 180 degree and pack into the frame for transportation without detaching any harness elements and using any locks. Due to patented fast locks assembly and disassembly of the protection cage are fast and error-free. The cage is strong and rigid enough when mounted while its elements are extremely compact when disassembled. The one-finger operated throttle makes easier handling during take-off and gives more control and comfort in flight. We are going to introduce the new model "Paraportator-S" which is now in serial production. Our serial and prototype paramotor units were demonstrated at major aeronautical exhibition at Friedrichshafen, Germany. April 8-11. Paraportator was presented at Las Candelas 2010. As usual it gained a great interest of paramotor pilots. Paraportaor was extensively tested during a paragliding trip to South Africa where it was flown in various aerial conditions at 3 different locations. Paraportator was demonstrated for the first time at CoupeIcare2009 and gained a great interest of public and press. © 2009, Paraportator. All rights reserved.